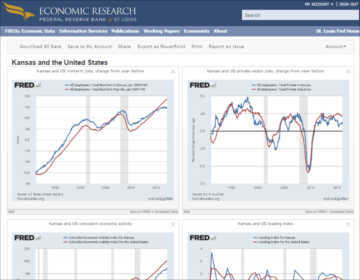 Dashboards of economic indicators for Wichita and Kansas, compared to the United States. Example of the Wichita economic dashboard. Click to view. The Federal Reserve Bank of St. Louis gathers economic data from sources like the U.S. Bureau of Labor Statistics and the U.S. Bureau of Economic Analysis. This data is then available in an interactive graphing and charting system. 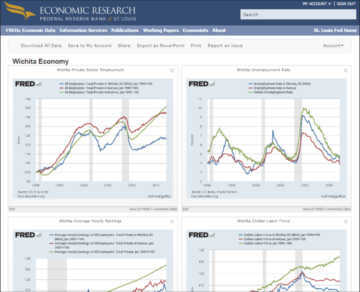 Example of the Kansas economic dashboard. Click to view. Using this system, I’ve created dashboards (collections of charts) holding economic data for Wichita and Kansas. The images of the charts are static. Click on a chart for the current data. At the bottom of each chart is the link “View on FRED.” By clicking on that link you gain access to the interactive version of the chart. You may then make many different types of customizations. Click here for the Wichita dashboard, and click here for the Kansas dashboard.